The high-tech cart is complete with LED lights, a USB outlet and a long-lasting battery. 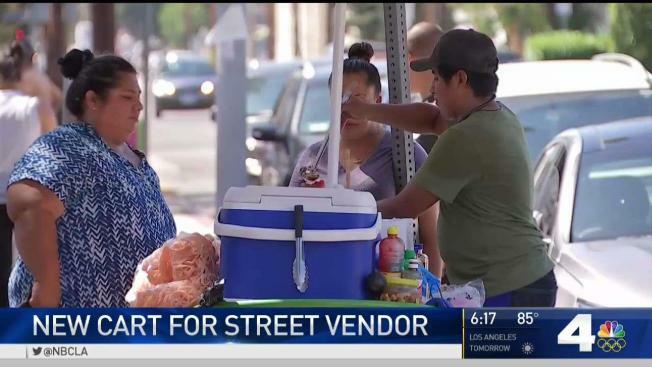 A Hollywood street vendor is back in business and rolling in style, selling elotes and raspas in the same corner where an angry neighbor tossed and flipped his cart months ago. Benjamin Ramirez was all smiles when he returned to Romaine Street and El Centro Avenue with a new, blinged-out, digitized and custom-made cart, provided to him by the members of the Los Ryderz bike group. "Mucha mejor," Ramirez told NBC4, saying the high-tech cart, complete with LED lights, a USB outlet and a long-lasting battery, is already better than his old one. In July, an angry couple confronted Ramirez, telling him he shouldn't be on the street because he didn't have a permit. At some point during the argument, the man tipped over Ramirez's cart. A video of the confrontation went viral, racking up nearly millions of views online and catching the attention and sympathy of many who wanted to help Ramirez. Around 10 people came together to revamp the cart, which was delivered to Ramirez on Sunday. "Of all the bad things going on right now with immigrants, and these are people stuggling to make a living," said Javier Partida of the Los Ryderz. Ramirez said his new cart cuts his commute time in half. And as far as being afraid of the man coming back, he says his neighborhood is looking out for him. "Don't give up, you got to keep working," Ramirez said.